This article has been written to explain how to use NVivo for your literature review process when doing your PhD. 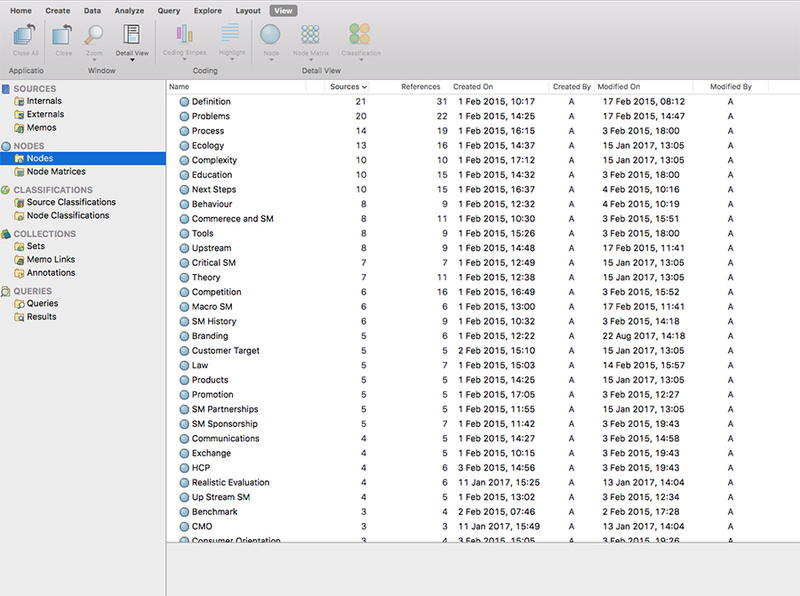 The examples I give are based on the NVivo for Mac platform which is a slightly different version to the Windows option, the principles and processes however remain the same. You might be asking, ‘why do I need to do this?’ Well, as a doctoral researcher you will be reading literally hundreds of articles and you’ll need some mechanism to file and capture the relevant bits. Also, as a future researcher you will need to revisit many of the articles you have read to produce your own journal submissions. NVivo will make the process more effective and efficient. It uses the principles of thematic analysis so you will also gain an excellent overview of that aspect of qualitative analysis. The two videos below are short presentations of the process and the remainder of the blog will give you a step-by-step guide. Step by step videos, click to activate. The first thing you must do is identify the appropriate literature to read. These could be journal articles, books, reports, websites or a range of other documents. An important aspect of the process is managing your references. 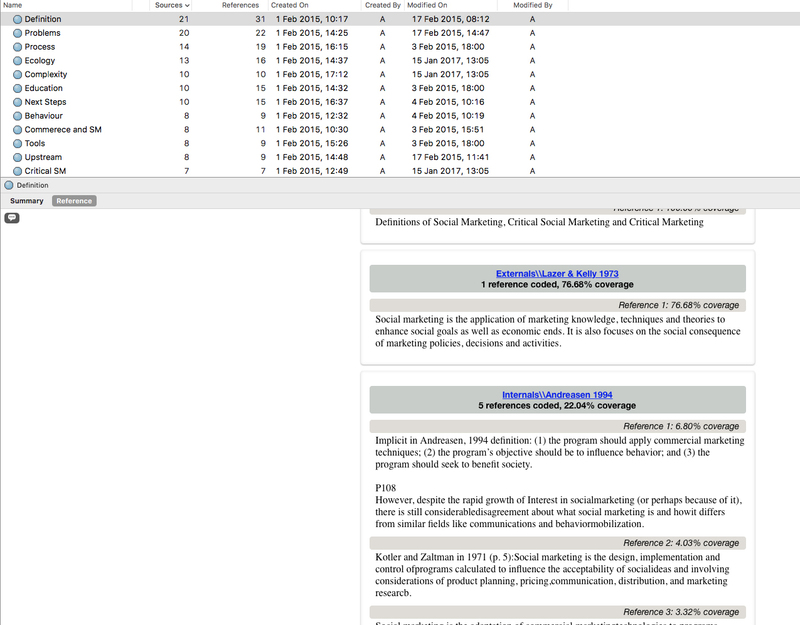 I use a reference management platform called Refworks, I will be explaining its use in my next article. 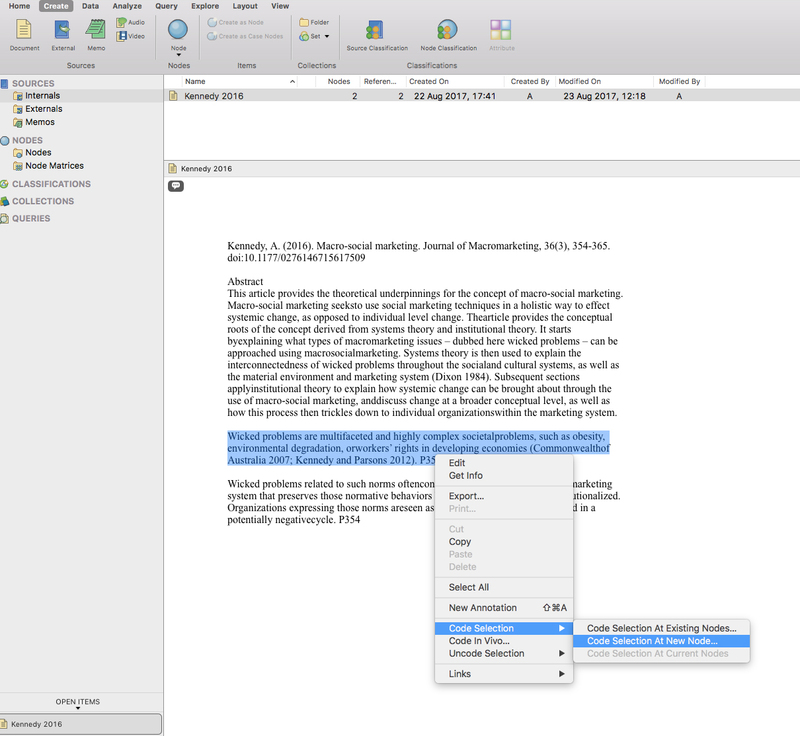 Before all else you will need to copy the citation of the article you are reviewing so that it can be pasted into NVivo, this will help you remember where the document came from. If this is your first review then you will need to create a new NVivo file, I recommend you name it the subject area you are focusing on. With NVivo open, create a new document by clicking on the ‘Create’ tab, then select ‘Document’ this will be stored in ‘Source’, ‘Internal’ (see figure 1). 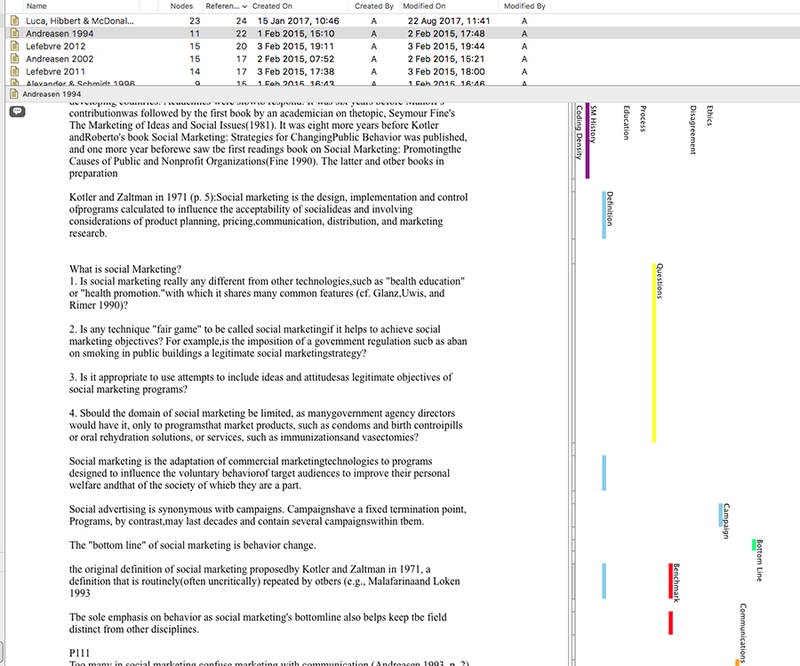 Figure 1: Creating a new document. Name the document using ‘Author’ and ‘Year’ as the nomenclature (i.e., Shaw 2017). 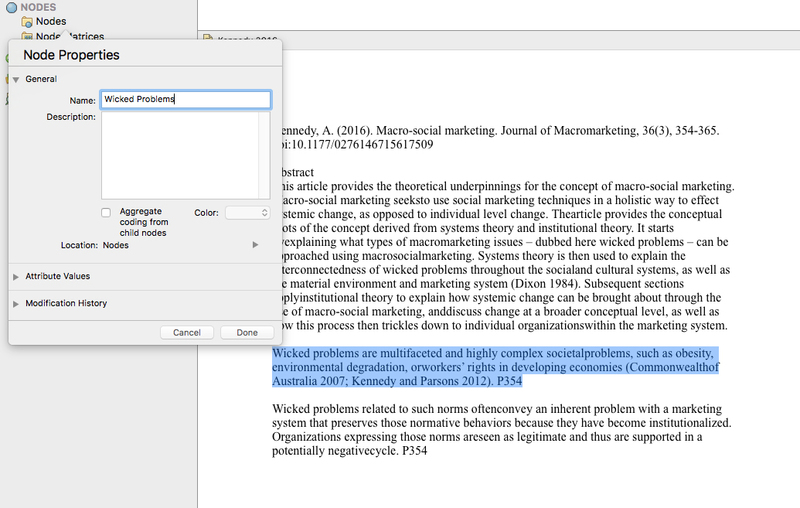 Paste the full reference at the top of the document, then copy and paste the abstract . Review your chosen piece of literature, then when you find something of interest, copy and paste it into the NVivo document as a new paragraph and note the page number. Pasting an exact copy gives you the option of either paraphrasing it at a later stage or using the direct quote in your work (this is why you need the page number). Once you have done this highlight the paragraph then give it a name (a node / code / theme). 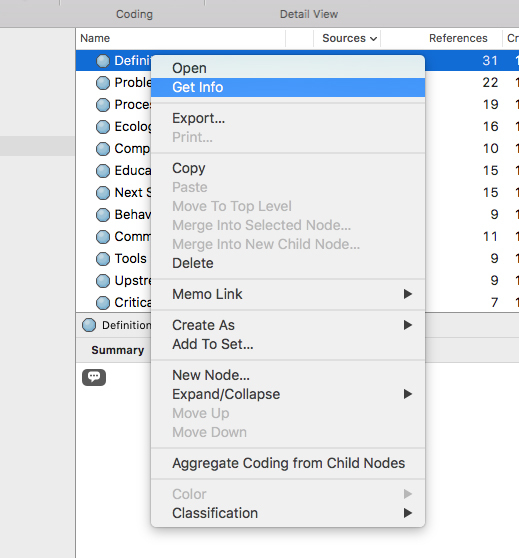 If it is a new node then right click your mouse and select ‘Code Selection’ then ‘Code Selection at New Node’, type in your node / code / theme name (this is likely to be a section heading you will use in your literature review), see figure 2a and 2b. If it is an existing node or if you are not sure if you have used it before right click your mouse and select ‘Code Selection’ then ‘Code Selection at Existing Node’, look up the appropriate node then tick the box, see figure 3a and 3b. Continue the process until you have completed reviewing the chosen piece of literature. 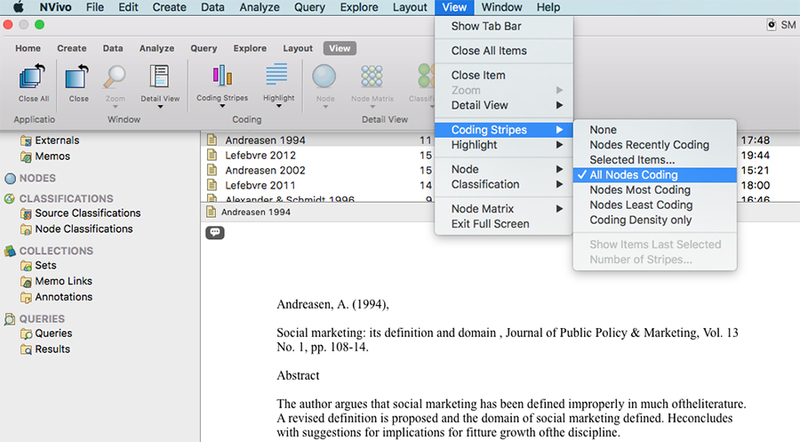 You can review what you have done by clicking on the ‘View’ tab, then ‘Coding Stipes’ then ‘All Nodes Coding’. This will present the nodes on the right hand side of the document. Note, each word, sentence or paragraph can have more than one theme (code) see figure 4a and 4b. Once you have reviewed all the articles, books, websites etc, you can start thinking about how to structure your literature review. 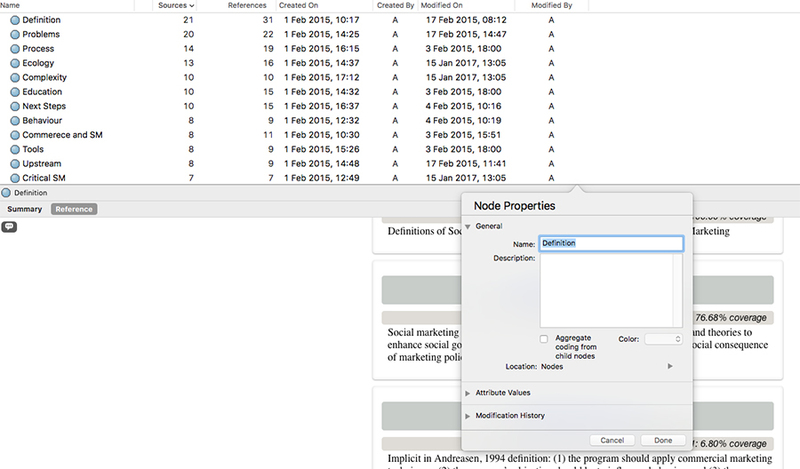 To do this you must first review each node, just click on Nodes (left window), you will see all your nodes / themes, you can sort them by clicking on the reference tab, see figure 5. When you click on the selected name of the node it will open showing you the aggregated data that you have saved (figure 6). This will illustrate all the authors (you have reviewed) that have given an opinion about the element of literature you have considered. You must then decide if it is worthy of a place in your literature review. If you click on the hyperlink it will open the original document, you can now retrieve the whole reference if required. You must create a list of all your chosen literature (I do this in Refworks, and as stated earlier I will be covering this in my next article). If, while reviewing the nodes you decide one needs changing you can simply right click on the node to change the properties through the ‘Get Info’ function: this can only be done if name does already exist (see figure 7a and 7b). There are also ways to merge nodes or create a hierarchy from them, I won’t go through the details now but will cover them in a later article. Some of you who who are familiar with NVivo might be asking, ‘why not upload the whole PDF, then create themes from that?’ Well, if you have a small number of pdfs to review then it should not be a problem, but if there is a substantial number (as you would have with a PhD) then you run the risk of making the platform unstable and it is prone to crashing (I learnt this by experience!). This is why I advocate copying only those sections which are important. 1. 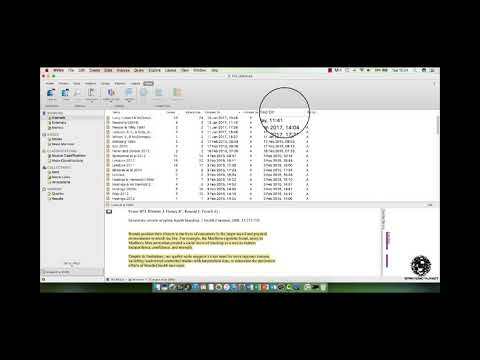 Create an NVivo Project. 2. Identify the literature you want to review. 3. Create a document in ‘Sources – Internal’. 4. Name your document: Author Year. 5. Copy the full reference into NVivo. 6. Copy the abstract into NVivo. 7. Identify words, sentences or paragraphs that are useful. 8. 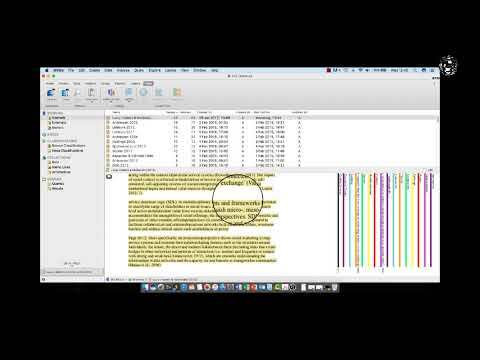 Copy and paste these useful words, sentences or paragraphs into NVivo. 9. Add the page number. 10. Highlight what you have copied and give it a node / theme. 11. Repeat process until literature review complete. 12. Sort and review nodes to develop the literature review structure.